Must be paid by Friday, May 11, 2018. 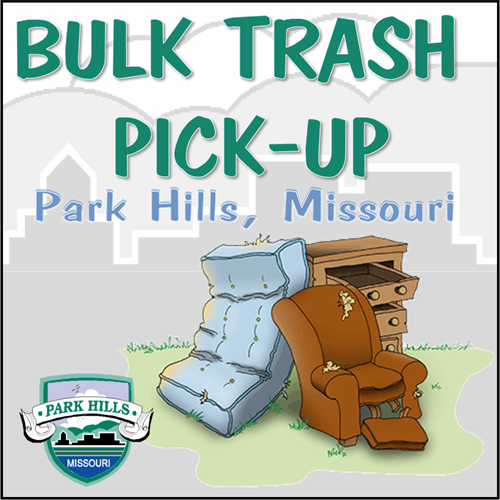 The 2nd of three Bulk Trash Collections for Park Hills Ward 1 will be collected on Monday, May 14, 2018. The deadline to sign up is Friday, May 11th. A fee of $7.50 is required to participate. Come to City Hall at 9 Bennett Street Monday - Friday 8:00 a.m. - 5:00 p.m. to sign up. Bulk trash collection will include household furniture and appliances, with a total weight not to exceed one-half ton. Bulk trash collection will NOT include vegetative matter, tires, batteries, other hazardous materials, or construction debris. Appliances that have compressors and/or Freon (i.e. refrigerators, air conditioners, freezers, etc.) must have compressor removed. No single item to exceed 250 lbs. Exceeding the limit may result in items being left behind. If you are unsure of which Ward you reside, click here for a Park Hills Ward Map. For all question, contact Park Hills City Hall at 573-431-3577.